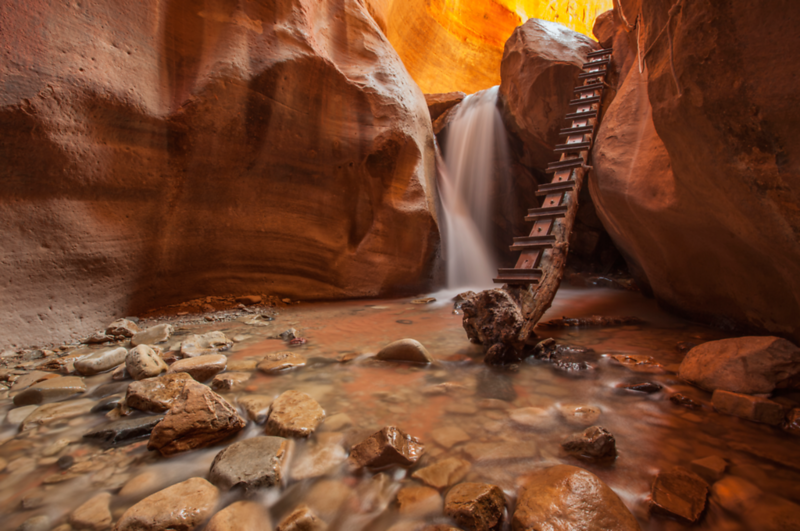 Kanarra Creek is a scenic slot canyon hike just north of Zion in Kanarraville, Utah. It flows through a beautiful narrow red rock canyon that starts on the slopes of Kanarra Mountain, a few miles north of the Kolob Canyons area of Zion National Park, and exits the Hurricane Cliffs at the little town of Kanarraville. The Navajo sandstone formations are similar to those of Spring Creek a few miles to the south, but the gorge is deeper, the narrows more extensive and the scenery even prettier. The stream carries a fair amount of water all year, especially in spring, so a hike up the canyon always involves extensive wading, and climbing past several waterfalls. The slot section extends for over a mile then gives way to a bright, tree-lined gorge which can be explored for several more miles.